Ohio’s Gregory Kolo is the latest player to win a World Series of Poker bracelet after taking down Event #12: $1,500 Pot-Limit Hold’em, a result that also banked him a bankroll-boosting $169,225 in prize money. Kolo came into the final table as the chip leader, thanks in part to him eliminating former November Nine member Phil Collins close to the end of play on Day 2, and never really relinquished that lead throughout the final table proceedings. It took 38 hands for the first player to be eliminated from the eight-handed final table, Ryan Schoonbaert pushing his short stack into the middle with and being called by Kazu Oshima’s . A final board reading was not what Schoonbaert was hoping for and he busted in eighth place for a $16,384 score. Schoonbaert’s exit opened the flood gates and the eliminations came thick and fast. On Hand #42, David Martirosyan raised to 70,000 and then snap-called when Ahmed Amin reraised all-in with what turned out to be . By the river the board read and Amin’s tournament came to an abrupt end. Four hands later and former PokerStars executive Dan Goldman check-raised all-in with on a flop and was looked up by Oshima and his . The turn was a relative brick, but the river completed Oshima’s flush and ended Goldman’s hopes of winning Event #12. As we said earlier, the exits came thick and fast and when Tom McCormick three-bet all-in over the top of an Oshima raise on Hand #52 it turned out to be his last move of the tournament. Oshima called with and got their against McCormick’s pocket threes when the board ran , leaving the final table with only four players seated at it. Those four became three 14 hands later with the exit of the aggressive Russian David Martirosyan. He raised from the button and then called with when Oshima set him all-in from the big blind. Oshima had made his move with the dominating and was in great shape to win yet another pot. Oshima had the hand locked up by the turn of the board and Martirosyan’s deep run ended. 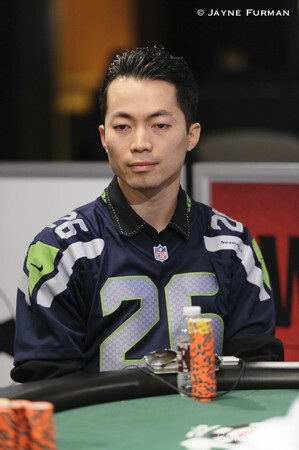 Third place was settled only two hands later when Dean Bui committed his stack with and was looked up by Kolo and his . The first three community cards fell followed by the , which gave Kolo an unlikely straight, and when the river was the , Bui busted and heads-up was set. 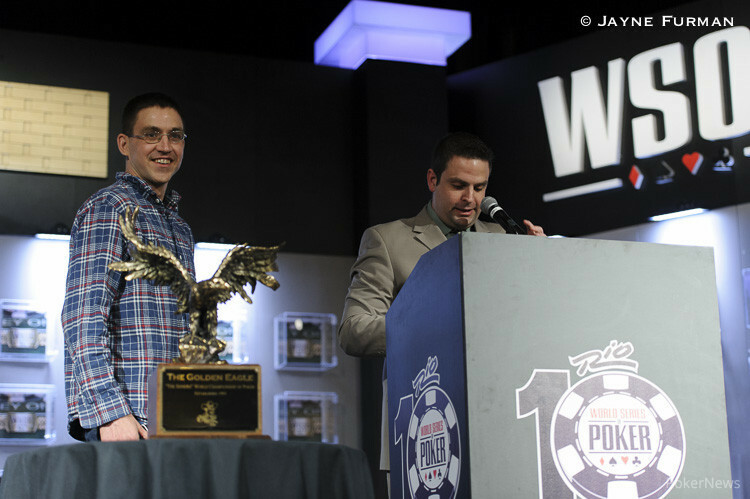 The heads-up duo only played six hands before a champion was crowned. Kolo raised to 50,000 and Oshima called. The dealer spread the flop, Oshima initially checking before check-raising to 130,000 after Kolo bet 50,000. The turn was the and Oshima fired 200,000 at Kolo and Kolo called, taking the hand to the river. Oshima sat motionless for a few moment before looking at the dealer and announcing he was all-in. “Call,” came the rapid response from Kolo and Oshima looked devastated. Kolo flipped over for two pair and Oshima slammed his cards face down on the table before walking away with his face in his hands. The dealer showed the hand, as per WSOP rules, and revealed for an ill-timed move gone wrong, not that Kolo was bothered because with that hand he became the latest WSOP champion and $169,225 richer in the process. Hand #73: Oshima set the price to play at 50,000 and Kolo called. The flop came down , Kolo led for 55,000 and Oshima called. The turn was the and now Kolo checked. Oshima sat motionless for 15 seconds before moving to pick up 130,000 chips and Kolo folded. Hand #74: Kolo opened the preflop betting with a 50,000 raise and Oshima called. The first three cards came . Oshima checked, Kolo bet 55,000 and Oshima check-raised to 130,000. Kolo rubbed his face as if stroking an imaginary beard before calling. The turn was the and Oshima pushed a tower of chips worth 200,000. Kolo called with eight T25,000 chips. The river was the and Oshima moved all-in. Kolo called and showed and a disappointed Oshima slammed down his hole cards and walked off the stage. The dealer turned his card over and showed . 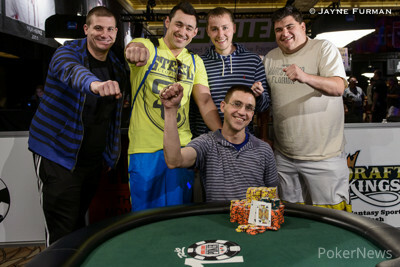 Kolo is the latest player to win a WSOP bracelet. Hand #69: Kazu Oshima raised to 50,000 and Gregory Kolo called. The flop was the and both players checked. The turn was the and again both players checked. The landed on the river and Kolo led for 25,000 and Oshima folded. Hand #70: Kolo raised to 50,000 and Oshima called. A flop reading was checked around. The turn brought the into play and Oshima bet 85,000 and Kolo folded. Hand #71: Oshima raised to 50,000 and Kolo made the first three-bet of the heads-up match, making it 120,000 to play. Oshma responded with a fold. Hand #72: Kolo lmped the small blind, Oshima raised and Kolo let his hand go. 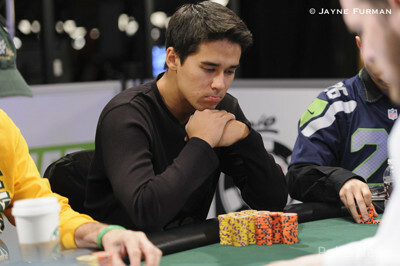 Hand #68: Dean Bui raised to 50,000 and Gregory Kolo three-bet to 150,000 from the small blind. Bui said "now or never" as he pushed all in for 323,000 and Kolo made the call. Bui tabled the and Kolo turned over and needed to find some help. The flop of brought some new outs for Kolo and the turn would give Kolo the straight. The river sealed it and Bui is bounced in third. Hand #67: Kazu Oshima opened to 48,000 and his opponents folded. Here are the chip counts as of the break. Temecula, California’s Kazu Oshima is no stranger to the World Series of Poker. He made the jump from the online poker world to the world’s biggest tournament series five years ago, but found very little success here in Las Vegas. But now there’s been a sudden breakthrough and he finds himself here at this final table, three-handed, with a bracelet and some $169,225 for first hanging in the balance. PokerNews caught up with Oshima to discuss his experience so far and see what’s ahead for him. How has this experience of playing at a WSOP final table been for you so far? It has been everything I’ve ever dreamed of. This is my fifth year here and I’ve been able to do anything. I’ve been dreaming about this since I was 14 years old, 11 years, and I haven’t had any success at the World Series at all. I’ve lost every year I’ve been here. I’m still young, but I’ve put in a lot of hours and it feels really nice to have it pay off. Has play at the final table been what you expected it to be? There hasn’t been anything too crazy, pretty much what I expected, except ending up here three-handed. That’s what I hoped for but certainly not what I expected. Pot-Limit Hold’em doesn’t seem to attract the large fields No-Limit does. Do you feel like this is your game, or do you just play everything you can get your hands on? I got 14th place in this same even three years ago and that’s the best finish I’ve had here, so I think I have a pretty good idea how it works. Plus with the small field too you have a better chance of winning a bracelet. You made a deep run at the L.A. Poker Classic recently, and now this, what do you think has changed that you’re seeing all this success on the live felt now? Patience, that’s a big thing. I feel like I am a pretty patient person. Letting those big hands go when you know you’re beat, and making big calls too, sometimes I just get too attached. I’ve played a lot of heads-up where you play every hand, so ten-handed ring games can be like nails on a chalkboard, you have to fold and fold for hours. So really, patience is the biggest thing I’ve improved on for sure. So what’s your plan going forward three-handed? Just to try and let the game come to me, see how they play and adjust to that. I have a lot of experience playing shorthanded, so I’m very comfortable and excited to be at this point.